First, the good news: I am no longer starving! With the TPN, 24-hour fluids (Dextrose 5%), and minimal tube feeds, I’ve gained 25 lbs since the hospital stay in January and about 35 lbs since my very lowest last year (prior to Zofran and liquid nutrition). With the extra weight and additional nutrition, I’m feeling great. I have tons more energy. Yes, I’m still sleeping long days, but I’m able to enjoy my waking hours far more. I’m even able to get back to work! This success, however, is in stark contrast to the enormous failure (so far) of the GJ-tube. Don’t get me wrong – I’m still very grateful I have it, but it wasn’t the panacea we had hoped for. Since I got it, we haven’t been able to run at a rate higher than 10 mL/hr. That’s two teaspoons in an hour. My small bowel can’t even tolerate a rate that slow. On average, I can feed for about 2 hours (sometimes 15 minutes, sometimes up to 6 or 7 hours) at this rate before I either (a) start getting back flow and the tube dislodges; or (b) the alarm on the pump goes off incessantly and I can’t manage to pacify it. (I’d like to make a side note here about how incredibly annoying and embarrassing it is when your feeding pump goes berserk in public – especially if you’re in a quiet place like a movie theater or the library. Ugh!) Then I have to let it rest for an hour or so before I can start it up again. Keeping in mind that I also take about 50 mL of liquid medication through the tube each day (and I have to stop the pump for an hour to bolus my meds), I’m lucky if I can get 100-120 mL through the tube in a 24-hour period. Usually, I only get in an additional 50 mL a day, and some days, none at all. It’s depressing. Especially considering that I’m supposed to take in over 800 mL (in addition to medications) each day to reach my daily caloric minimum. This here is why we’re so grateful for TPN. That said, however, I would not trade in my tube. 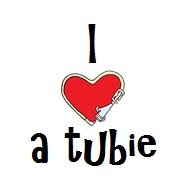 In the last month, I’ve had two GI bugs that have made me VERY grateful for the tube. While my niece and nephew spent days vomiting and getting dehydrated, I got to use my tube to “pleasantly” vent out what would have come out my mouth. I also got to use my tube for days when the pain and bloating got to be too much for me. If I didn’t understand the risks that come from venting too often, I would certainly opt to do vent 24 hours a day. In short, my tube has saved me hours – probably days – of laying on the cool bathroom floor in pain and nausea. Yep, I’m keeping my tube. But now on to today’s appointment! In December, I switched my care from a pediatric gastroenterology motility specialist at Tuft’s Floating Hospital for Children to an adult gastroenterology motility specialist at MassGeneral. This was a hard decision for me to make because I really loved my pediatric specialist. He’s one of the first doctors who really “got it.” He was fun and had been aptly nicknamed “Speedy Gonzalez” by the dysmotility inner circle. But we were having difficulties because he could not admit adult patients. Even though I’m only 26 and the size of a young teen, it didn’t matter. So when I got really sick, I had to go through the ER. So we transitioned to an adult specialist. My new doc is great. I really lucked out. Our story was like many others’: doctor after doctor looked at us quizzically when we described the unusual things my body did and then they’d dismiss it. Either I was exaggerating or it really didn’t happen. Even when I had numerous witnesses and photo and video evidence. Dr. K listened. He really listened. His bedside manner doesn’t come close to the pediatric doc, but I’m okay with that because, like the peds doc, Dr. K listens. Our appointment today was at 11am so we were finally in an exam room around 11:30 with his fellow. Almost immediately, the consensus was that the new motility drug (domperidone) was not working. Because it’s expensive and the side effects aren’t pleasant, we decided it wasn’t worth the pain. We moved on to discuss the above struggles with the tubes. He didn’t looked shocked or in disbelief, but rather disappointed and concerned. He admitted that it happened sometimes. His hope was that my tube was somehow dislodged. Unfortunately, I was having these issues a week into the tube and had been checked for a dislodged tube. He wanted to check again. He looked at me and said that he still had hope we would figure it out and get me working. He then continued with sadness in his eyes that sometimes people with mitochondrial dysfunction don’t ever benefit from feeding tubes, and sometimes, TPN becomes the only viable long-term option. I knew this; for goodness sakes, I have MANY friends who are on long-term TPN. But I never really considered that my body may make me one of them. I’m okay with this realization, but it honestly surprised me that I had never considered it may be my only possibility for a healthy future. We are not, however, ready to just give up on the tube. We did the tube study, and as we had predicted, the tube was functioning perfectly. My body, however, was not. After the technician removed the syringe from my extension tubing, the contrast and my gastric juices (sorry for the graphic imagery) began spewing back at him at a rather high rate. He looked at me and said, “it’s definitely not your tube, but there’s definitely something not right.” And such is life with mitochondrial disease.